老友行蹤＊＊＊ 歡迎新知舊友齊齊行山樂＠＠＠ 敬請留意出隊通告.同時亦希望過路的BLOG 友們留言分享大家的旅遊,行山樂趣 ,彼此能建立一個良好溝通平台. I am Tommy, an old boy but new to hiking. Joined KC's hiking only 4 times. I write this review because I like to make a little contribution. Please excuse my english because my computer cannot handle chinese. my review: very exciting, very good for hiker. Not too suitable for new hiker. must have good shoes for lots of slippery slope, stick, gloves and a cap. The last part of the hike by about 4PM is very challenging as I am exhausted. If the last part can be started first in the morning, when there is more energy, it may be easier. But I understand pubilc bus may be hard to arrange to hike the last part first. my review: the beginning part is very slippery with wet trees leaves and branches, but it is not too long with the last part of the hike very well planned, and suitable for new beginner. This is not a hard trip, but a long march! By about 4:30PM, we have to climb three "ladders to the heaven". Not for new or too old, a long march that really test your energy. If the trip can be hiked in reverse, that is, hike the very steep last part(hill top) first in the morning, the rest is not bad and anyone new or old can try. But again, public bus may be hard to arrange to hike in reverse. My review: This is not too easy for hiking, but it is well planned and the trip length is just right. The view is very nice, as good as any hike I have been. Must have all the hiking gears. New hikers can challenge themselves, while experience hiker enjoy the view. This is all I have to share. Please share your view. Appreciate the comment. I am new to hiking and my review is intended for new hikers, or other people who passes by this blog who may have idea to offer, or those who likes to join. 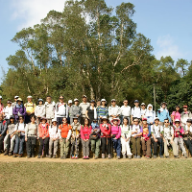 No need to say this is a good hiking group with lots of experience. There is always higher ground to be achieved, and yes it was a challenging trip, so I hope we can once again do 龍鼓灘群山! !